A friend of mine posted this a bit ago. She frequently posts these types of messages and prayers. They fill me all at once with sadness, anger, and immense amount of sympathy. Let me give you a bit of back story. She and her husband are in their early fifties. They were young, vibrant, active, and adventurous. Her husband had always been a tall, strong, imposing figure. Yet he was really just a giant teddy bear of a man, always at the ready with a hug and joke. In the blink of an eye that changed for them. He was riding solo on his Harley Davidson when someone turned across traffic in front of him. Unable to stop he slid underneath the vehicle. After days of touch and go, not knowing if he would live or die, he pulled through. She was awash with relief and sang the praises of her God. Then the devastating news came that the brain damage would be permanent and also the paralysis. That has been some four years ago now. The longer it goes the more desperate she becomes. She loves her husband and takes very good care of him but it is now more of a mother/child relationship. She has amply displayed her commitment. Yet she longs for that husband/wife relationship that she once had. She would never verbalize this but she can’t even move on. It isn’t even as she would want to if she could, but she can’t have her husband back either. Neverland. And while all of that fills me with a great sadness it also fills me with sadness that in order for her to come to terms with her situation she must do these mental gymnastics. She prays to the God she believes caused her situation to thank him for it. Thanking him for causing her circumstances in order to bring about her dependence on this invisible entity that cannot give her an embrace, cannot kiss her lips, cannot hold her hand – this invisible entity that cannot carry on regular conversation but is only voices in her head. Yes, it is indeed sad. It makes me so angry to watch as she struggles day after day with his pain management. She has long given up praying for healing. She believes her God’s answer is, “no,” that her husband must suffer and she along with him for some greater purpose. And that purpose is a desperate need for dependence on the very being that caused the pain in the first place. She will sing his praises and glorify him for breaking her down. On Earth we call that abuse. It’s like watching a parent beat their child until everything in them is broken and watching that child beg the parent to do it all over again. Stockholm syndrome doesn’t even begin to describe it. The anger that wells up inside of me is visceral. And at the same time I’m filled with so much sympathy and so much understanding of why she needs this to be so. It might all be too much to bear if it doesn’t serve some purpose. She needs to believe that all of this has some meaning or else she might just throw in the towel. It would likely break her mind to believe otherwise. This is why religion persists, why it will likely always persist. And who could be so cruel as to even attempt to take the one thing that is holding it all together for her away? Categories: Uncategorized | Tags: abusive relationships, Anger, Doubt, One-Sided Relationships, Relationships, Religion, sadness, sympathy | Permalink. He’s a pro. He’s the best. Just ask him. He’s as racist, bigoted, and misogynistic as people feel. We need an exterminator to take care of the problem. Trouble is, nobody’s asking, and even if they are they don’t care about the answer, how he’s going to do this. You trot off to work, leaving him to fix your problem, without even asking for a plan of action. You carry on, blissfully, throughout your day knowing when you get home those damned raccoons will be gone. Oh, happy day. The exterminator calls you, just after lunch to tell you that the problem has been resolved. He’s taken care of it and those pesky raccoons won’t bother you any more. He’s left a bill in your mailbox. On your drive home you’re singing along with the radio – rocking out, actually – excited to get home to your peaceful, beautiful, raccoon-free home. You turn down your street and there are people standing out in front of what used to be your house. The only thing left standing is the mailbox. It’s been raised. Flattened to the ground. He used explosives and blew it to smithereens. Sure enough, just as he said, there’s a bill in the mailbox. It’s more than you can afford. And he blew your damned house up! You’re not paying that bill. Except you ring him up to tell him so and he says that, yes, you will pay the bill. He did what was requested. You said you wanted those raccoons gone, and you wanted them gone pronto. He did that. You never asked how that would be accomplished. You didn’t discuss the terms of any agreement. Only that you agreed to pay him to get rid of the raccoons which he did. And if you don’t pay the bill he’ll see you in court! May the gods help us all. Ain’t America great? Categories: Uncategorized | Tags: American Exceptionalism, Anger, Extremism, Misogyny, Politics, Presidential Election, Racism, Trump | Permalink. 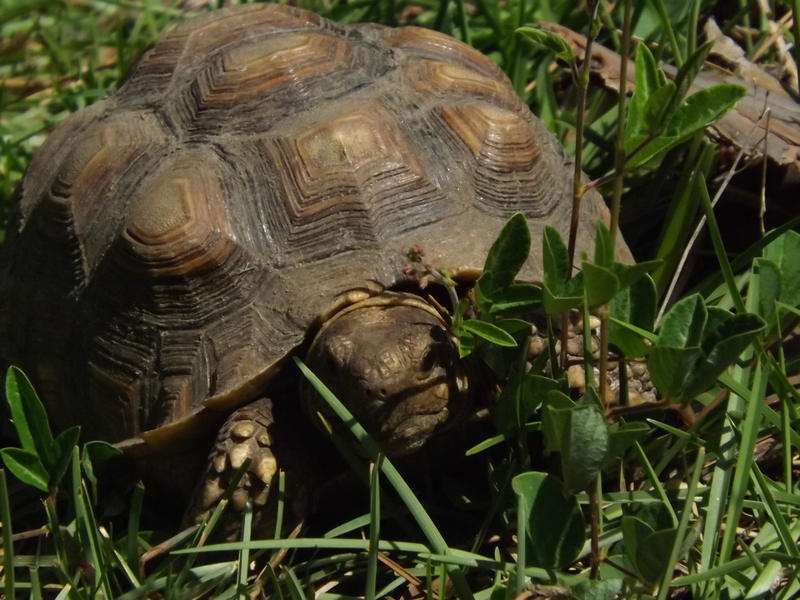 This cute little gopher tortoise showed up in our garden! Am I bitter? I’ve been told that I am. Okay. Maybe. It depends on which of these definitions you use. Have there been experiences in my life that have left a bitter taste in my mouth? Who hasn’t? That might be a shorter list. Have I had experiences that were painful or that I felt in a strong or unpleasant way? Who hasn’t? That might be a shorter list. Usually, though, when someone calls you bitter it’s that last bit of the definition they’re alluding to. Am I angry and unhappy because of unfair treatment? The short answer is no. At least I don’t see myself that way. Then again, we often have trouble seeing ourselves as we truly are. But I don’t feel angry or unhappy. Having said that, I do get angry sometimes when certain topics come up based on my experiences. For instance, when someone – be it a man or a woman – says that a wife’s submission is the bee’s knees and that it’s a perfect plan for harmony within a marriage. It’s God’s plan afterall. You know what? I’m not totally opposed to submission. The way I experienced it had horrific results. That doesn’t mean it doesn’t work for anyone ever. Sometimes men choose to submit, too. Sometimes people just want all the little details taken care of and never to have to make any decisions. If the two people involved are cool with that then who am I to say that submission is a terrible idea? In fact, there are many relationships where one is submissive and the other more dominant. And they aren’t all religious. If it’s a free choice made because a person knows themselves well then I think it can make for a mutually beneficial relationship. However, if the submission is based on coercion (i.e. lording religious precepts over one’s head)? That’s where I can become angry. If, based on your religious beliefs, you want to submit to your spouse, by all means go right ahead and do that. But if, based on your husband’s religious convictions he forces submission by continually reminding you it is your wifely duty, that you are sinning if you don’t, or threatens you in any way – emotionally or physically – it isn’t willful or chosen freely. In fact, if your husband is doing any of those things you might be in an abusive relationship. The teachings on submission within religions are but mere weapons in the arsenal of an already abusive person. Anyone who uses scripture to guilt you into doing things to suit them is being abusive, be they male or female. So, the long answer to the question of whether or not I’m bitter depends on whether you believe that a person’s life experiences informing their ethics makes them bitter. If you learn nothing from the experiences you’ve had, if you can’t recognize what you’ve been through and honor that with future life choices and held values without being labeled bitter it is likely that there is something wrong with the label maker – not the labeled. Categories: Uncategorized | Tags: Abuse, Anger, Bitter, Bitterness, Ethics, Freedom, Fundamentalism, Labels, Marriage, Morals, Religion, Submission, Values | Permalink.